Berwick Rangers have confirmed the signing of a new striker. Blair Henderson, who was previously with Bonnyrigg Rose, has joined the club on a full transfer. 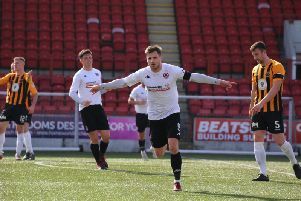 The 20 year-old, who has been in prolific form this season, has signed a contract to the end of the 2015-16 season, and is available to go straight into the squad for Saturday’s home game against Montrose in Scottish League Division Two.